Do you want to achieve a perfectly cooked dish, including meat or candy? Use a kitchen thermometer. Whether it’s baked, deep-fried or grilled, you’ll definitely achieve your desired taste with this kitchen gadget. A thermometer is now essential for most cooking as it takes away the guessing game while cooking and provides accuracy. Because of this primary function, thermometers have taken the lead in the demand for kitchen gadgets. You’ll see an array of them in the market from the simple temperature to the innovative digital ones. There is a thermometer for every taste and budget. 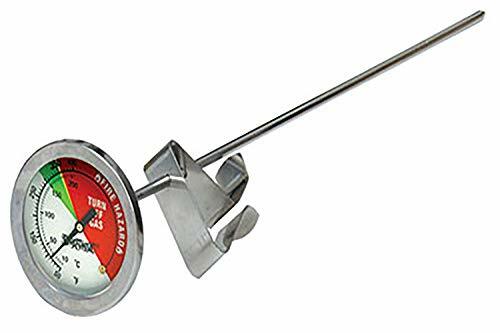 Here, we present to you the Top 5 Turkey Frying Thermometers for perfect cooking and turkey deep frying. While you can rely on guides like these ones to give you a general picture of things, nothing is more accurate than these ones. Nobody wants undercooked meat. It’s actually downright dangerous! And you also don’t want overcooked meat. It can be rubbery, chewy and less delicious than it should be. A thermometer helps you to achieve meat perfection. It’s hard to deep fry a turkey perfectly because they’re so big. Don’t worry. Help is here. They’re used all the time in restaurants and commercial kitchens. Don’t worry that it’s “cheating.” The pros use meat thermometers all the time! This time, we’re arranging them according to their efficiency and features. They may not be ranked according to price, but we swear, they are still worth your money! Don’t get us wrong. These devices are not just for turkey-frying. They are for other cooking types too, including all kinds of meat. 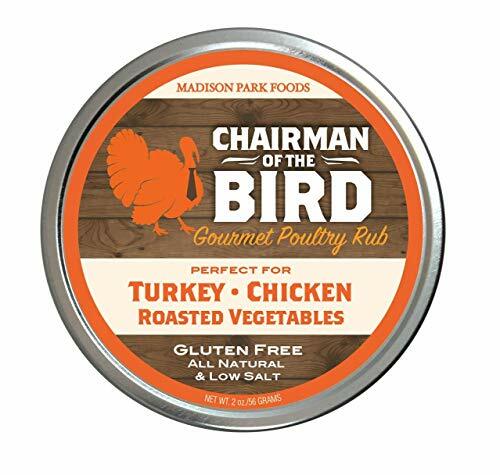 Read on and see which of our featured products suits your cooking needs and to learn more about them. Let’s get to the details you need to know. 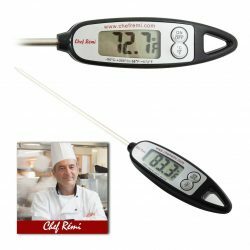 The Chef Remi Digital Grill Thermometer is highly rated on Amazon with an impressive reviews. The high rating makes this product a bestselling item on the popular site. If you’re looking for a digital deep fry thermomter, then look no further than this one from Chef Remi! One of the most impressive features of this cooking thermometer is its LCD display. It instantly displays accurate temperature results. It doesn’t matter if you are an expert in the kitchen or just a newbie in cooking. What matters most is that, this digital thermometer is so easy to use. 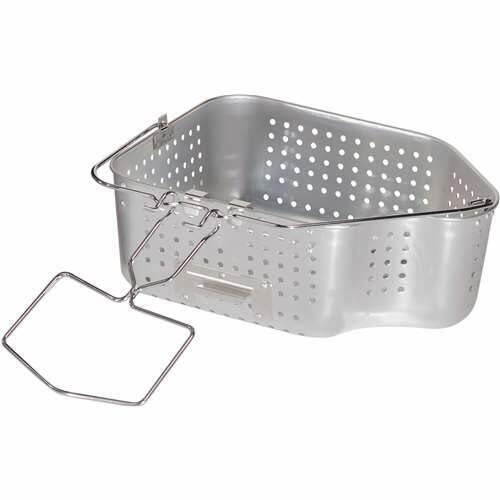 It is best for indoor cooking and you can simply place it anywhere in your kitchen, your deep fryer, saucepan or oven. You can actually use the Chef Remi Digital Grill Thermometer for outdoor cooking too. Remember, it is designed for grilling! This cooking gadget is very flexible, especially considering the reasonable price-tag. 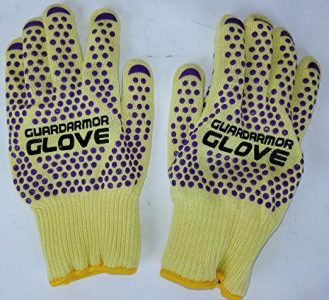 What’s best about this product is that you are guaranteed of lifetime satisfaction. You have a 100-percent money-back warranty for a lifetime. So, what are you waiting for? It’s a great product at a fair price. 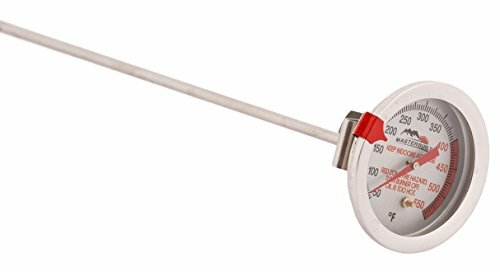 Like our No.1 in the Top 5 Turkey Frying Thermometers, the CDN InstaRead Deep Fry Turkey Thermometer also got great user reviews on Amazon. You’ll find this more impressive yet less expensive. If you love hosting special occasions at home, this cooking gadget is best for you. It is designed to measure the temperature of dishes being cooked in large containers. Plus, it still has lots of durable metal in the construction of it. 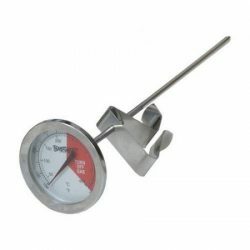 This is undoubtedly a durable kitchen thermometer that it is made of solid laboratory glass lens. It’ll last you for years and years. And you’ll be using it every single day. Don’t worry about burning your fingers when digging it in. The CDN InstaRead Deep Fry Turkey Thermometer has a 12-inch-long stem. 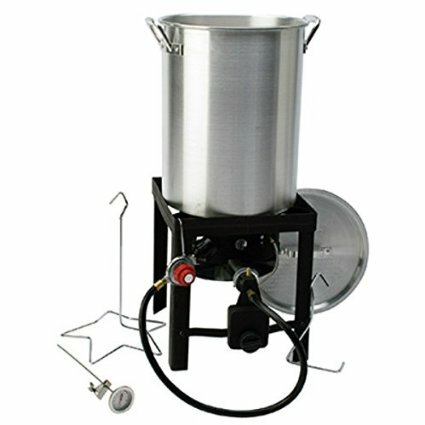 At such a reasonable price, you surely get total satisfaction with this cooking aid. Cooking will even be more convenient for you especially with durable stainless steel clip that’s adjustable. 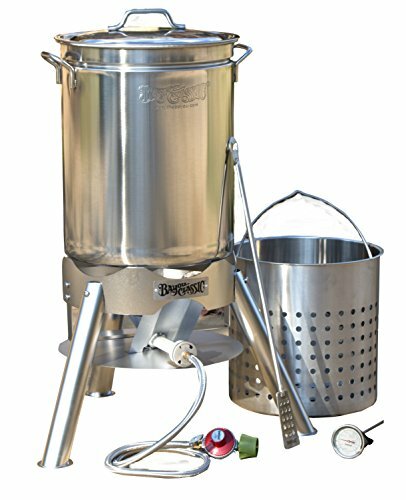 With a five-year warranty this product offers, you can always guarantee efficiency with our Amazon bestseller here. You need not spend much for perfect results in the kitchen. 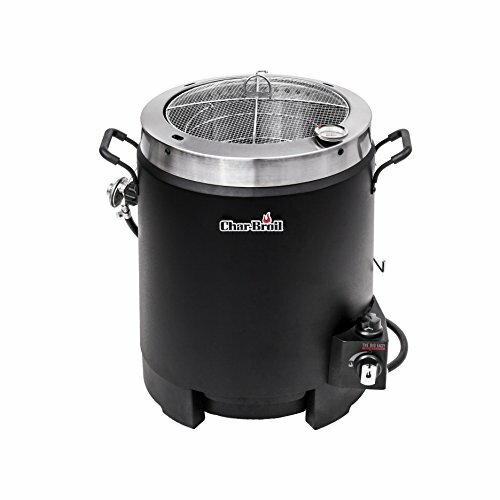 Masterbuilt Butterball is one of the most trusted names in turkey frying. 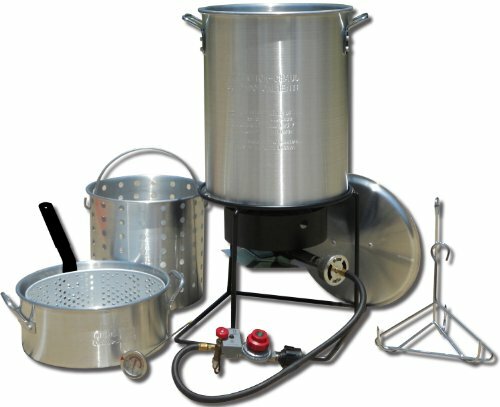 We love their line of indoor electric deep fryers and have a hard time recommending anything else. Do you hate complications and prefer an easy-to use device? Consider the Masterbuilt Deep Fry Thermometer. 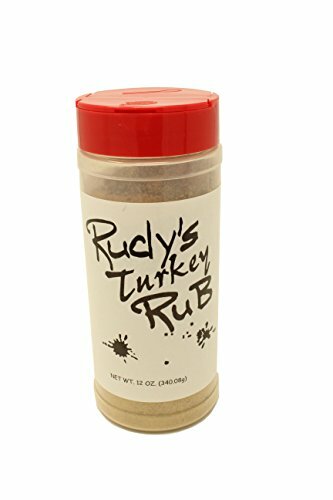 Our third in the top 5 Turkey Frying Turkey Thermometers is safe to use. It is 12 inches long and comes with a pan clip for sure protection. If you don’t have perfect 20/20 eye vision, this cooking gadget’s large temperature is a bonus for you. The said feature is intended for easy reading. Now, with the Masterbuilt Deep Fry Thermometer, you can proudly serve delicious meat dishes cooked to perfection. Indeed, this kitchen gadget lets you read effortlessly your meat’s temperature. Show off the chef in you and serve your family a deep-fried turkey. You need no expertise here. What you need is a small amount of cash to have temperature reader that can measure up to 550°F. Cooking some hot stuff? This is the one for you! According to the reviews, many people also use this one as a candy thermometer and have some great results with it. Hit the button below and purchase the Masterbuilt Deep Fry Thermometer today. Along with Butterball, the other big name in turkey frying is Bayou Classic. 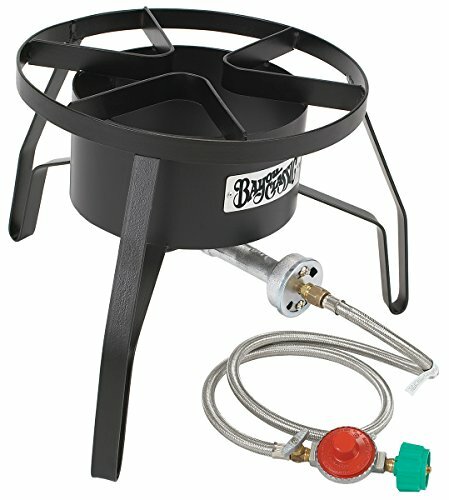 They make some serious machines for outdoor frying. And it’s one of the best brands in the business. The Bayou Classic Thermometer is our most affordable item on the list. If you prefer the conventional type of reading, this is perfect for you. This kitchen thermometer is made of stainless steel. It is also 12 inches in length so handling it is easy and convenient. What’s impressive is that, this thermometer can read the maximum heat of 750°F. That’s some serious cooking and it’ll never tap-out at the high end. It’s one of the best choices for a deep fry oil thermometer because of the handy clip it has to attach it to the pot. You can keep an eye on your oil temperature as it’s heating up to know exactly when to put your food into it. The Bayou Classic Thermometer has a tempered glass face. Therefore, it is durable and can last for years. It gained a high rating on Amazon with an impressive score. 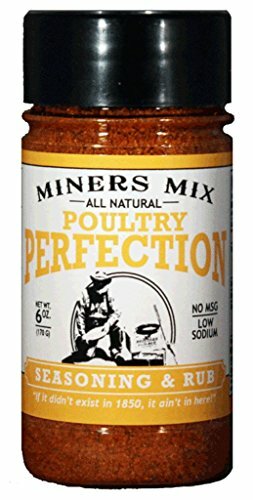 You can use this for any cooking style. Whether you’re baking, grilling or deep-frying, this classic temperature reader gives you accurate result. Achieve perfect results in cooking with the most affordable cooking thermometer available. Go to the Amazon page and purchase the Bayou Classic Thermometer today. It’s one of the best choices for a deep fry oil thermometer. Rounding out our list of the Top 5 Frying Thermometers is this digital one from Naz. It’s a great product at a very reasonable price. This innovative kitchen device is a multi-tasking temperature reader. 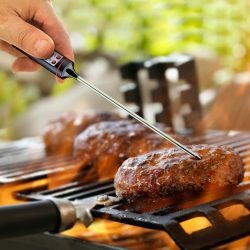 It measures the heat for any kind of cooking including grilling, deep-frying of turkey and other meats, barbecue, candies and all kinds of foods. It’s an all-round star that you’ll use every single day. And last but definitely not the least is for the tech savvy cooking enthusiasts. It reads temperatures in both Fahrenheit and Celsius. Love it? We do too! Your Canadian friends who come to visit will feel happy! 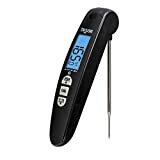 More so, you can read easily and instantly the temperature as the Naz Digital Cooking Thermometer features a LCD display. Indeed, this temperature indicator displays results instantly with its fast display feature. What sets it apart is its swivelling head that can be rotated for easy-reading. This is an all-around thermometer! Aside from kitchen use, you can also rely on this device when you want to measure the heat of your baby’s bath water. Get instant and accurate results with kitchen gadget. We love this thing! And we’re sure you will too. Buy the Naz Digital Thermometer on Amazon. 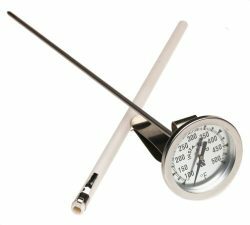 We hope you loved our list of Top 5 Fryer Thermometers! Before you go, we have one more for you to check out that recently came across our radar. Another top pick for kitchen tool is this one from Taylor. It’s got a ton of great reviews and many people love the handy folding feature. It has a very thin tip to keep all those juices inside the meat, and a fast response time of 6 seconds or less. It also make an ideal candy thermometer when an accurate reading really does matter. This thermometer from Taylor features advanced Thermocouple technology for a more accurate read. It also has a quick response time, and wide temperature range (-40 degrees C to +300). There’s also a hold feature that allows you to remove it, while still seeing the last taken temperature. Best Frying Thermometer: Have your Say! What’s your go-to brand for the best deep fry thermometer? Leave a comment below and let us know your thoughts. And don’t forget to share this on Facebook, Pinterest, or Twitter.